Is there anything more stressful about attending a sporting event than finding good parking? 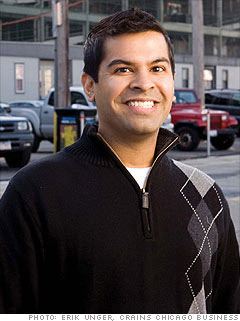 Aashish Dalal didn't think so, and he founded Parkwhiz.com in 2006 as a result. Marketed as Expedia.com for the parking industry, Parkwhiz.com registers hundreds of parking lots and garages across the country and lets customers reserve spaces online for baseball and other events. The company is partnered with more than 1,000 parking providers and 125 venues in more than 30 cities across the country. Prices for each parking space are set by the lots, and Dalal and company take a percentage of the final sale. The operation has proved to be quite lucrative: Parkwhiz.com is experiencing year-to-year growth of 350%, with 1,000% growth over the last two years. "Our value proposition is that we provide peace of mind, knowing that you're not going to miss the first pitch," said Dalal. That's good news for fans of the 25 MLB teams that Parkwhiz.com currently services. And by the end of 2012, Dalal hopes to have deals with all the baseball teams and teams of other major sports.